The Amish Pine Wood Swing A-Frame helps create a private oasis for you and a companion in your backyard. 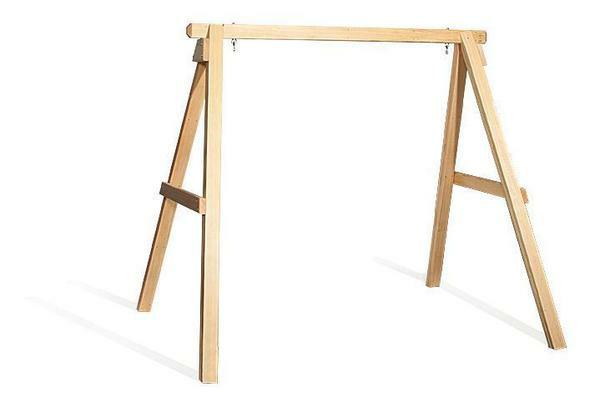 No matter your outdoor decor, a wooden swing with this a-frame will look great. Order this Amish Handcrafted Pine Wood Swing Frame to fit a four foot swing, five foot swing or a six foot swing. This is just for the A-Frame Swing Stand and a swing is not included in the price. We offer a wide variety of swings to go with this stand such as our Amish pine wood Fan Back Swing or pine wood Curve Back Porch Swing. Check out our beautiful Amish made swings to go with this swing stand.